Judging from the e-mails I got yesterday - you all really LIKE this scrapbook project! THAT makes my heart so happy and really makes me want to do more scrapbooking!! The Sticky Die Cut Stocking was just screaming for glitter, so I added some Dazzling Diamonds to the cuff with my 2 Way Glue Pen. On this page, I added some baby powder to half of the Sticky Die Cut so the photo would slide under it and not stick. Cool, huh? 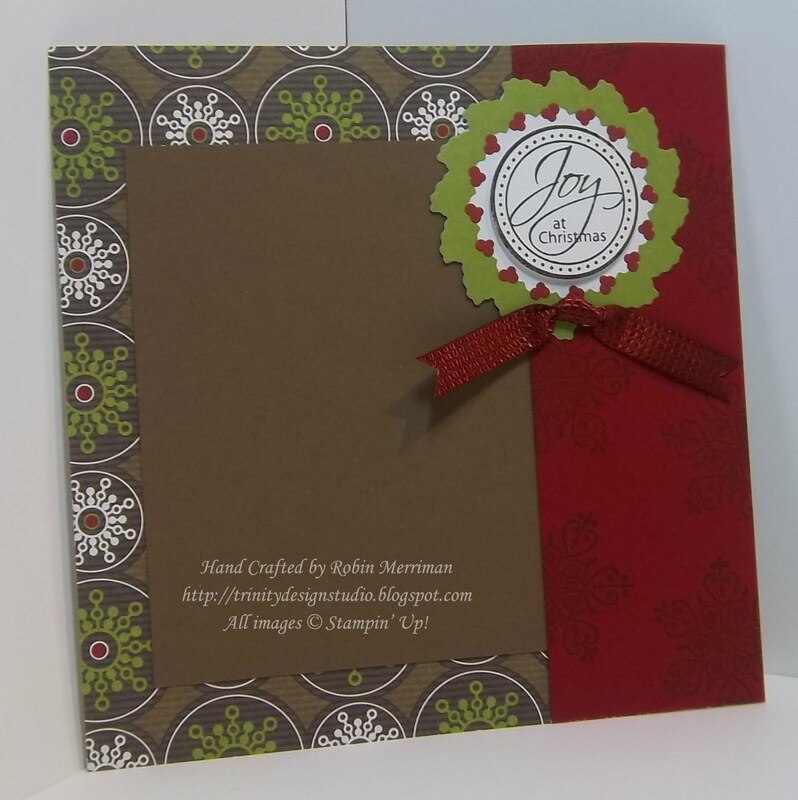 The center image is stamped out of the Perfect Punches Stamp Set, punched out and popped up on Stampin' Dimensionals. That gorgeous Cherry Cobbler Ribbon makes it into a sweet wreath accent. I love the border element on this next page. I just punched a border strip out of Whisper White cardstock with my Scalloped Ribbon Border Punch and threaded some Old Olive 1/8" Taffeta Ribbon through it and topped it with a sweet bow. 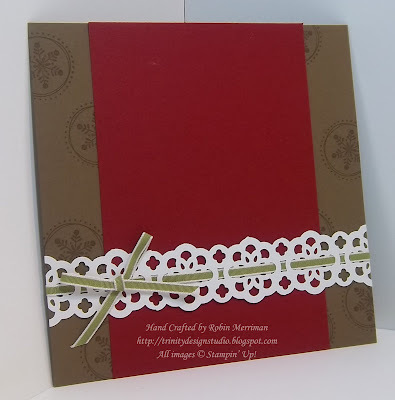 Cute and Easy, plus the photo will slide right under the border or you can journal below it. 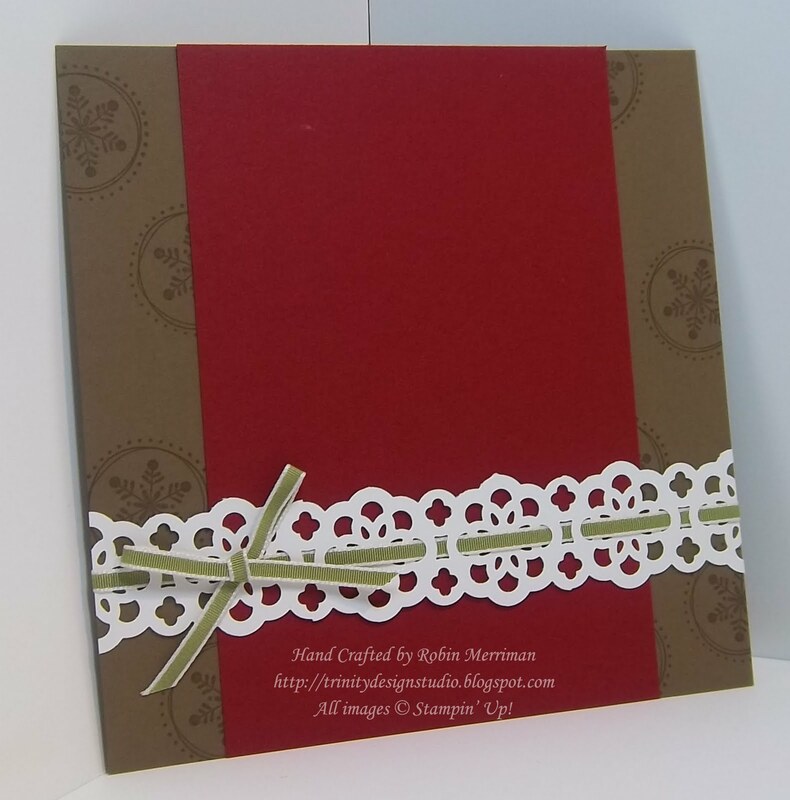 The Cherry Cobbler cardstock on this page was texturized with the Snow Burst Embossing Folder and the photo mat has a simple wrap of Old Olive Satin Ribbon. More baby powder on the Sticky Die Cut keeps it from sticking to the mat/photo and a button finishes off the element. These next two pages are two of my favorites in the whole album - my other two favorites will post tomorrow - I added Dazzling Diamonds to the torn edges of the cardstock on each side and on the Sticky Die Cut Border piece on the next page. Lots more stamping with the Winter Post Stamp set too! 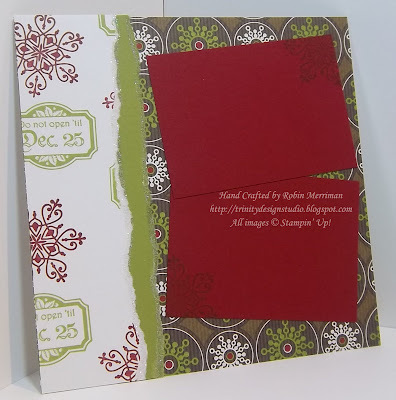 This page was fun with the Scalloped Square Die cut piece for the photo mat. Just a little Rhinestone Bling to finish it off! So, there you have it - more fun pages! Tomorrow you'll get the last few pages and then on Saturday, I'll show you the four cards that were made with the kit leftovers! Don't forget that my new Robin's Rewards Program begins officially TODAY!! You can get all the details at this post HERE. Be sure to download the simple tracking form so you can begin keeping track of all your qualifying orders and earn your FREE Stampin' Up! product!